The oldest public school in Winnipeg and the last old downtown school sits rather anonymously on Vaughan Street, just north of The Bay. The land Isbister School stands on once belonged to the Hudson’s Bay Land Reserve. 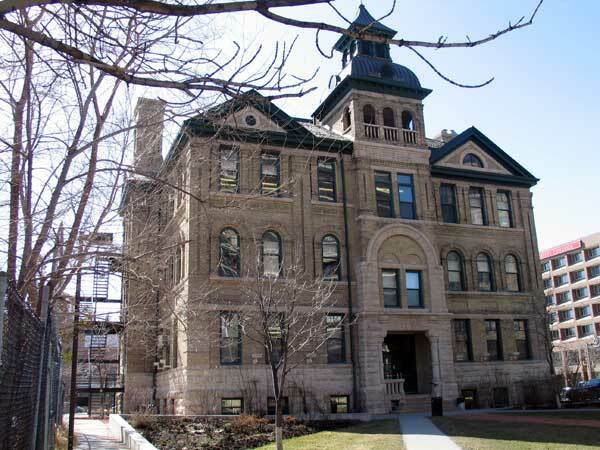 The School Board purchased a block of lots at $100 each from the Hudson’s Bay Company and in the summer of 1898, the contract for this ten-room, three-storey building was let to builder D. D. Wood. Architect Samuel Hooper supplied the plans. 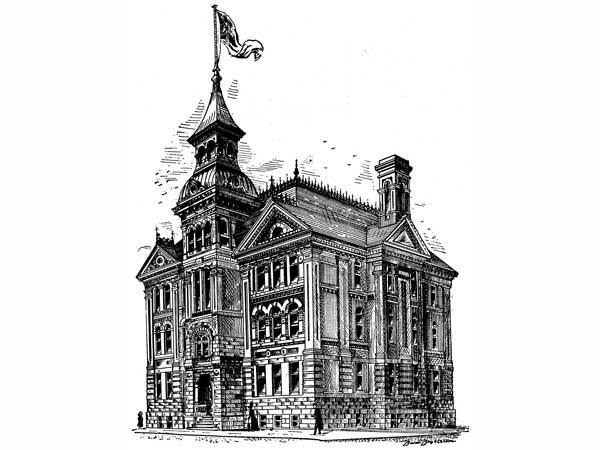 The cornerstone was laid with a silver trowel by School Board Building Committee Chairman Angus Browne at a grand ceremony on 26 September 1898. 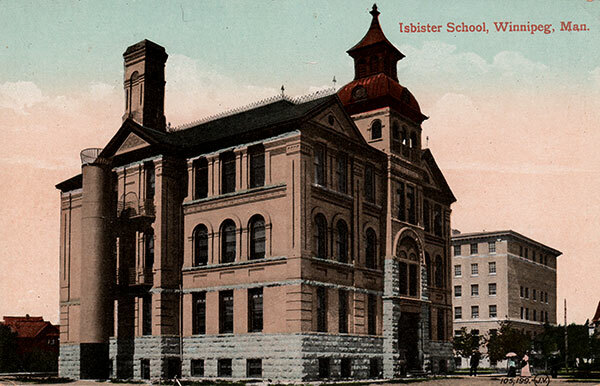 On Isbister School, Hooper employed Queen Anne style architecture, an eclectic style used mainly for residential buildings in Winnipeg. This makes any public building using the style particularly special. After decades of service, Isbister School suffered the fate of other downtown schools suddenly in the middle of business districts rather than residential neighbourhoods. Dwindling enrolments caused the school’s closure in 1964 and it seemed likely the old place would be demolished. It received a reprieve, becoming the Adult Education Centre in September 1967. It even survived the 2004 onset of an incongruent steel, concrete and glass addition on the north and west sides. Luckily, the façade retains its 1898 face, glorious even with pollution-darkened brick. The school bears the name of Alexander Kennedy Isbister, the son of Orkneyman Thomas Isbister and Cree Mary Kennedy, who was born in 1822. Isbister studied at universities in Scotland and England becoming a teacher and writer, completing 21 textbooks. Among the noteworthy alumni of Isbister School, you will discover Rhodes Scholar Skuli Johnson, local printer Gordon Stovel, and singer/comedian Pat Riordan. 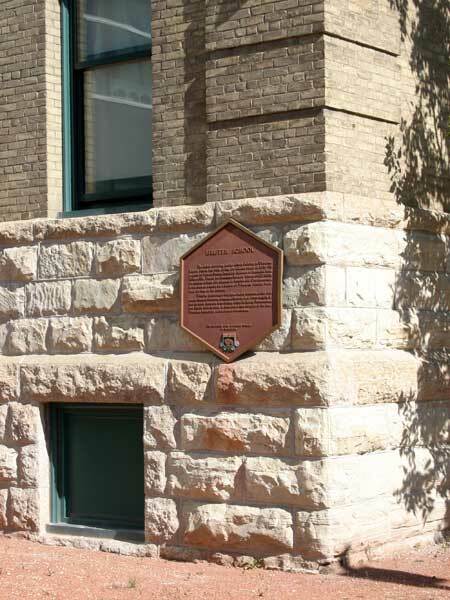 Located at the southwest corner of the school building, a plaque from the Historic Sites Advisory Board of Manitoba gives a history of Isbister School. 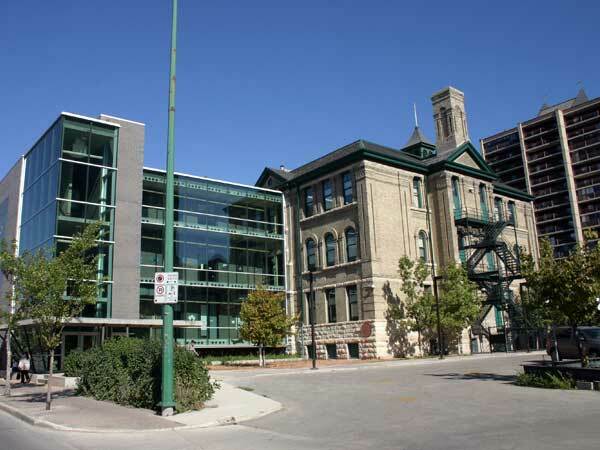 In 2001, a restoration of the building’s roof was recognized with a Heritage Winnipeg Conservation Award. The building is a municipally-designated historic site. Source: Province of Manitoba, Plans and Specifications for Rural Schools, 1903. “The Isbister School,” Winnipeg Daily Tribune, 27 September 1898, page 4. “Winnipeg schools, No. 12—Isbister,” Manitoba Free Press, 28 October 1922, page 3. “Isbister early famed for sports, mouth organ band” by Claire Tisdale, Winnipeg Free Press, 27 January 1949. Isbister School, Manitoba Historic Resources Branch. We thank the Winnipeg School Division and Reid Dickie for providing additional information used here.